Dreaming of a white Christmas? 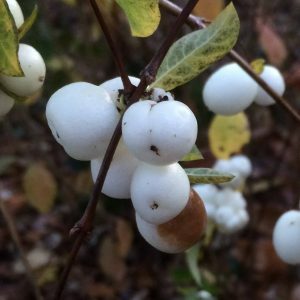 Well, the plant for today’s blog is Symphoricarpos albus, the Snowberry. It’s a member of the Caprifoliaceae or Honeysuckle family, native to North America. It was originally described in Linnaeus’ Species Plantarum in 1753 as Vaccinium album L. (Ericaceae). Since 1914 it has been referred to as Symphoricarpos albus (L.) S.F. Blake. The generic name refers to the compact cluster of fruits. It derives from the Ancient Greek συμφορεῖν (sumphoreîn), meaning ‘to bear together’, and καρπός (karpós) meaning fruit. 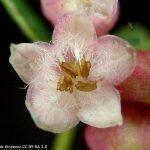 Although the pink flowers are rather inconspicuous, its “slender branches are loaded with clusters of berries, of the snowiest white, throughout the autumn”. Its common name needs no explanation, once you see the distinctive fruits (fig.1). 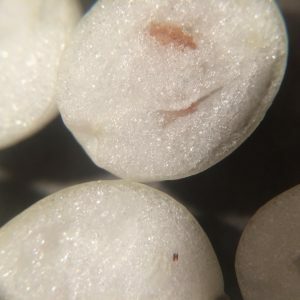 In Flora Britannica, Richard Mabey mentions how these are known also known as ‘Lardy balls’, as they resemble lard packed in pig’ bladders (a local custom perhaps). The inside of the fruits is also rather festive, beautifully resembling glistening snow (fig.2). The fruits can persist long into winter, which might suggest that they’re not particularly tasty. In fact, they’re poisonous to humans. Snowberry was introduced into cultivation in Britain in 1817, originally as an ornamental and then also used for game-cover. The first record of it in the wild was 1863 in Oxfordshire (vice-county 23). It has since become widely naturalised in Britain and Ireland (fig. 3). Most of these plants are S. albus ssp. laevigatus. The Snowberry is actually one of our most common neophytes (plants introduced after 1500). 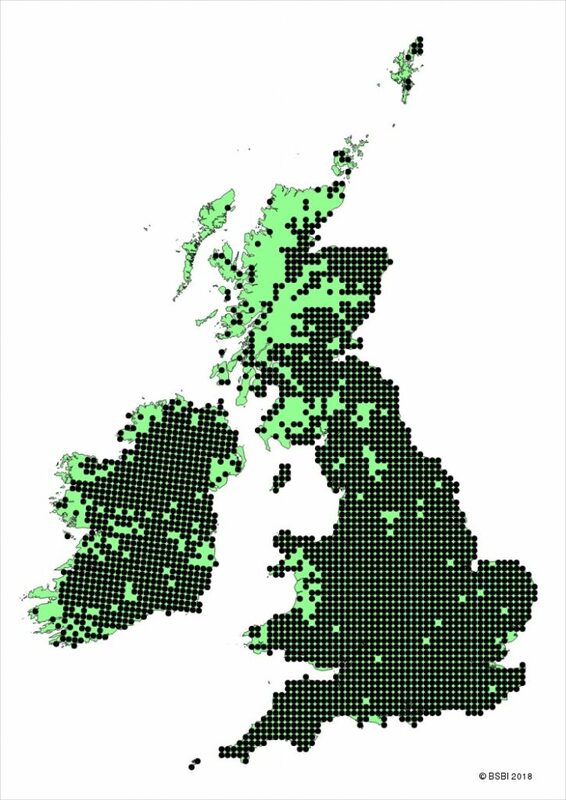 That’s surprising, given that it is not known to set seed (much) in Britain and Ireland. Rather, it spreads vegetatively by rhizomes and suckers. Is it invasive? The Snowberry is listed as an RHS ‘thug’ (i.e. potentially nuisance plants) and it’s recognised as invasive in Alien Plants (Stace and Crawley, 2015). However, it’s not currently listed in Schedule 9 of the Wildlife and Countryside Act. It’s the invasive potential of ornamentals such as this that I’m looking at in my PhD research. You can help me find which ornamental plants might escape and become our future invaders by completing a short survey. Nadolig Llawen – Merry Christmas!